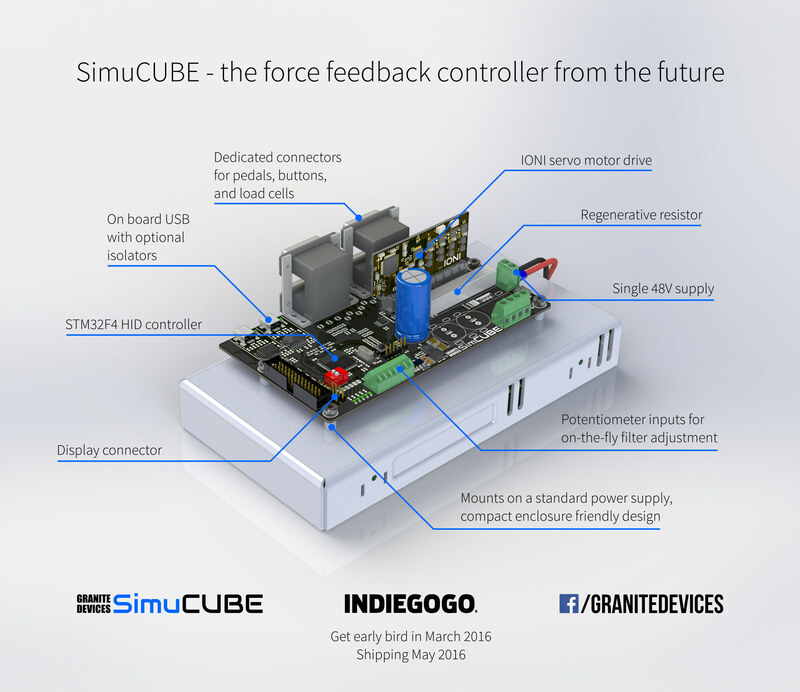 I’m happy to reveal the details of the upcoming force feedback controller – SimuCUBE! The hardware design is now complete for prototyping and we will get prototypes in the lab in the next month. SimuCUBE has a STM32F4 microcontroller that is compatible to a popular STM32F4 Discovery board. The plan is to start an open source firmware project for this board. SimuCUBE will change the way simulators are built. Click to enlarge. Brilliant hardware design & image render by Aki. This entry was posted in Announcement, Hardware, Ioni, Simulators, Technology insight by Tero. Bookmark the permalink. I was considering using a Clearpath motor with a combination of leveraging what others have done, and some customization, but this looks much better. Can you provide an estimated availability date? How does Clearpath motor compare to the popular MiGE? Anyways, I love to see different approaches & innovations happening around sim community! Perhaps one day I will make a gallery of user projects around FFB. I’ve seen so many pretty builds. We hope to make it to Indiegogo in March and ship on May. If we can do it with one prototype cycle, this is quite realistic. Based on the first manufacturing quotes, the SimuCUBE may end up around 149 eur for SimuCUBE board. In addition to bare boards, we will surely make a kit of all parts where some kit discount is included. Me and a whole bunch of frends of mine are looking forward to this. Price and availability is very important for sure. Will it be able to run machines like Kollmorgen AKM52? Other then Servo motor and Simucube, what else will be needed to start racing? Kollmorgen motor is no issue as long as it has compatible feedback device (incremental, and possibly BiSS support is coming later). Complete build guides will follow after release. For price estimate, see my reply on the above. Hello Tero, I am looking forward to your SimuCUBE! How can I find the ” Indiegogo” planned in March you have mentioned above? Indiegogo campaign will be opened once we have received & tested the prototypes. Probably 1-2 weeks to go. @Tolga: About AKM servos…..I will buy a few of these SimuCubes for my 3 different AKM62/63 servos and make a work log with all configuration files shared. What is your email and we can keep in touch. Hey I have found a good deal for the below Kollmorgen machine. Is is compatible with SimuCube? Would you recommend it over the MiGE’s? I don’t have specs of this motor. The biggest question is the encoder: currently only incremental encoders are supported. Support for BiSS encoders may come later (it’s under works). @Tolga: previous message should read AKM52/53 servos. That would be great to follow. No. Torque coefficient is too low and feedback device is incompatible. All motors that work with IONI will work with SimuCUBE too. I have the Kolmorgen AKM52G and AKM53G servo motors and would like to get the complete kit. How do you setup the order for the 700w setup? To get complete kit with 720W peak PSU, you would need 3 perks: SimuCUBE kit, 500W PSU upgrade and 720W PSU upgrade. I hope this helps!